After seeing and photographing Luciola cruciata genjibotaru fireflies for the first time recently, I went out to look for another species, Luciola parvula. This species of illuminated insect, called himebotaru (ヒメボタル) in Japanese, has a tendency to light-up late at night, with the insects' noctural light-show peaking somewhere between 11pm and 2am in many places. In other words, way past my bedtime. We gave it two tries. On the first night, rain hit and cut everything short. 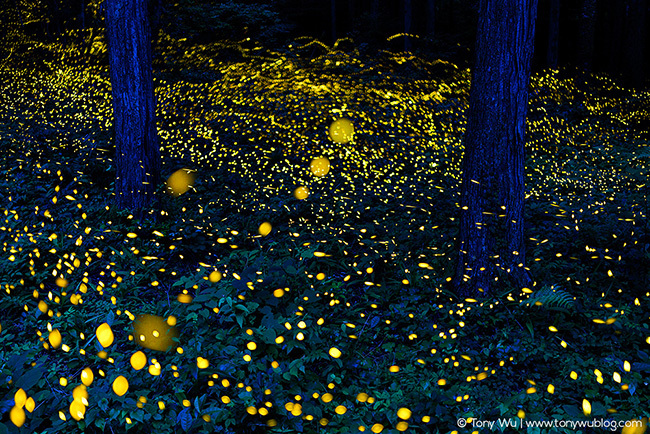 The second night, the fireflies started lighting-up a little before 8pm, which is super-duper-early for these insects. If you compare this image to my earlier photo of Luciola cruciata, you'll see that the pattern of light is different. Luciola parvula tend to have short bursts that appear round or nearly round, while Luciola cruciata individuals light up for longer, resulting in streaks of light. This differentiation makes sense if you think about it. Most likely, it serves to help the species identify themselves, as they only have a short time to procreate. Of interest, we did see a few stray Luciola cruciata cruise by, though where they came from, where they were heading, and why they were alone...were all mysteries. They did not, however, ever get confused and join the other species. Like before, this final image is a composite, comprising many individual photos taken over something like four-and-a-half hours.